We've all heard of Continuous Integration (CI). This blog post is a practical example of the topic with web development in Python and CI with Jenkins. A bit of Test Driven Development (TDD) is practiced. Ultimately it's the reader's choice to figure out what's right your themselves. The idea is to create a process of which in practice builds foundation for software. A safety net to catch defects early is part of the side effect, localizing complex systems into micro parts and test them to ensure quality over time. It's great for any pragmatists. Gives you a virtual sense of protection against bad & smelly codes. No matter how good your tests are, you still can't outrun bad design decisions. Tests are derived from design decisions. It's impossible to make it work perfect the first time, tests can be considered as battles. The more battles you won, the greater the chances of winning the war. Jenkins is there to make sure codes will always work on vanilla environments out of the box. Yes configurations are necessary evils. A great hat tip is to keep configurations separate from codes. What I wanna do is to extend both an idea and an implementation written by Aria Rajasa. He wrote a client to interface on an Online Banking frontend. It was necessary for him to check on it regularly without all the fuzz. The codes are written in PHP. I decided to clone it and build a Python equivalent with CI and best practices in mind. As of this writing, it's still an ongoing effort. What the codes will do is to automatically retrieve the latest mutation history of your bank account. An HTML frontend will then display the results. It was supposed to be a weekend project but I learned a thing or two on how to structure Flask projects more efficiently. Being a small and loose web framework, engineers can get lost with their separation of concerns. A lot of the implementations are inspired from Rails. I despise the language but I love the separation of concerns brought up by Rails. And conventions over configurations is also neat. Some remotes does not have the release branch yet. The branch is only pushed if an actual release is ready. The develop branch is where I merge different local (and remote if applicable) feature/* branches. A typical vanilla git repo will likely look like below. $ git commit -m "initial commit" . After pushing the initial commit to the master branch, immediately switch to the develop branch. Then set up the basic structure of the project. After I am done, I switch to a feature branch to start working. $ git commit -m "Add login feature" . $ git commit -m "add user profile controller" . $ git commit -m "add logout to auth" . At the end of a sprint, I would want a release branch for QA to test what I've been working at. $ git commit -m "fix buggy logout" . If you see at the last 2 steps above, I checked out and merged to the release branch after QA's report of a buggy feature. As long as the QA process is going on, do not merge anything to develop that is not a part of that release cycle. When QA has given the go ahead, it's time to merge to the master branch. This flow is inspired from here. The release branch strategy is the only difference. Flask is a micro yet powerful web framework. It is definitely not for anyone who wants structure. Being micro, Flask does not try to solve all the problems of a web framework. It simply wants to be a micro framework and do it great. Structure is key to a successful Flask project. My weekend is spent setting up solid structures with tested codes. The structure above is revolving that will eventually be a boilerplate. 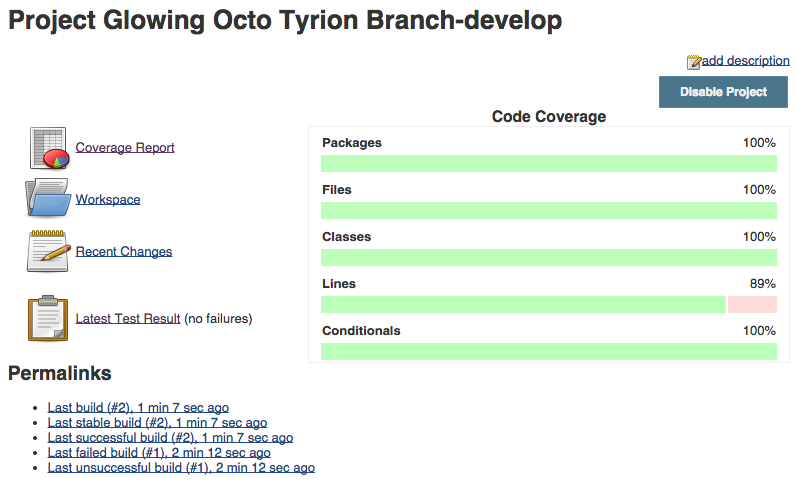 Let's take an example from the Glowing Octo Tyrion project. We have 3 helpers: app_helper.py, args_helper.py and yaml_helper.py. The helpers is matched with these test classes: app_helper_test.py, args_helper_test.py and yaml_helper_test.py. Let's examine yaml_helper.py and yaml_helper_test.py. I am a proponent of Defensive Programming and the error handling above is a reflection of it. Never trust parameters. In Java a method signature is allowed to throw all kinds of exceptions, this is lacking in Python. We'd never know what kind of exceptions a method can throw. That's why the unit test should also reflect the exceptions as seen below. If you see the test above, it is not as robust as I want it to be. Comparing the yaml_helper.py codes, there is still an untested line. After looking into PyYAML's source code, the error handling mechanism does not raises any exception upon failing. This is why I can only do so much to test the codes. However my second test case test_read_yaml_imaginary_file_should_raises_error is already defining possible exceptions. In this case, only 1 exception. Just by reading the unit test, supposedly it can and will be the best documentation of an application. Rails prides itself being a convention over configuration framework. Although the concept is nothing new, Rails brought the concept mainstream. Lending this concept to this project opened up some more niceties. I love dictionaries, hash maps or anything else you'd want to call it as. Cognitive load becomes cheap. I choose to use YAML as the configuration files format. It has smart referencing for generic objects and libraries are available in any platform. Python has PyYAML as mentioned before. The file config.yml.sample is no much different than what you'd find in any Rails installation. While the routes.yml is a convenience over Flask's verbose routing procedures when trying out Flask's getting started tutorial. Let's now examine the codes to make the routes applicable. The codes above dynamically load proper controllers for each available endpoint read from routes.yaml and look for the controller in the app/controller directory. For each declared route, the configuration also registers applicable HTTP Methods. This is validated against the controller class and raises HTTPMethodNotImplementedError if it's not satisfied. This way we are actually enforcing a pattern to be followed upon creating/modifying any endpoints. Also apparent, by keeping the configuration file in its own DSL, the application side (Python) of the project is prohibited to make direct modifications to its content. In other words, Cowboy moments are a thing of the past. With a dynamic and less verbose routing mechanism, the next subject is to manage frontend static assets. For this project, I have a few static asset formats I want to compile, minify and not worry about versioning at all. This is where Flask Assets came handy. Specifically to CoffeeScript, I don't want to execute another watcher each time I do my development. I want my app to be smart enough to see the changes and refresh accordingly. The codes above is lending concepts from Java and Rails. From Java, I enjoy having constants as values instead of just values. It's much more readable. While from Rails, the conventions within the codes are very apparent. We assume the assets are located in prescribed directories. Nearing to the end of the codes before returning is something that is truly Pythonic. Notice that the Bundle constructor only accepts multiple unnamed arguments as its files bundle. With Python, I can just put the files into a List and prefix a * to the bundle variable. This means that the Bundle constructor should accept all of the list elements within the bundle variable as it parameters. What is the best way to really know about your application? Yes certainly debatable. Personally, I feel the best answer for me is to know about all the errors that can and might happen within my application. By doing so, I enable myself a deeper understanding of the application and practice proper Defensive Programming. For this reason, I have a special package called errors. Errors or Exceptions is preferrably as detailed as it can be. Grouping errors is ok but not generic errors as it defeats the purpose of error handling. For this, I borrow the concept from Java. 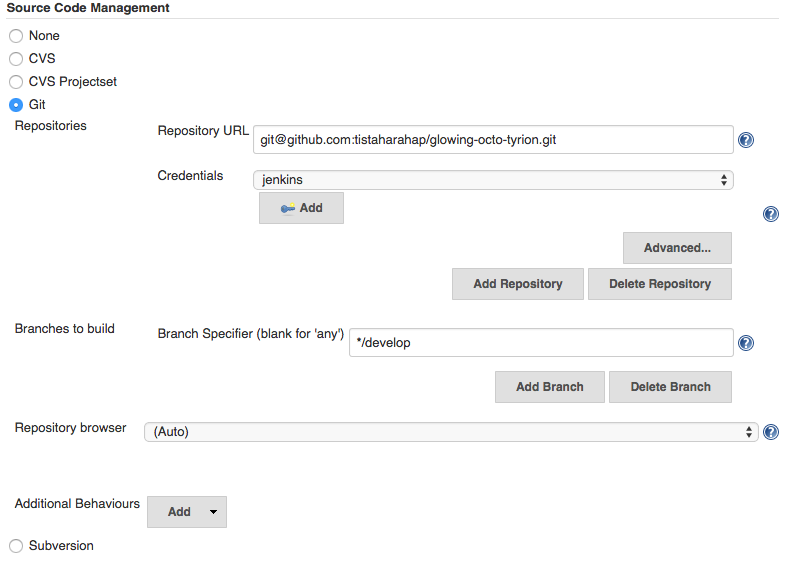 Jenkins is tightly related with the Git flow mentioned above. A matrix of how this relationship is formed is shown below. The X axis defines the Git branches while the Y axis shows the environments of which the branches are applied to. More about creating a project on Jenkins later. Obviously the plugin is crucial to use Git. Other than this plugin, make sure you have Git properly installed on your server. Create a personal token and give it permissions to access your repos. Configure this within Jenkins Configure System menu. 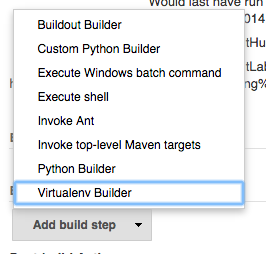 With this plugin, we can localize our Python projects by using virtualenv. On every build, we can also choose to do a vanilla install of the project. Ideal to keep your projects running out of the box. Since we're developing in Python, let's make sure that all the necessary dependencies are satisfied. Assuming Jenkins is already up and running, let's try setting up a new Jenkins job for the develop branch. When the dust settles, let's configure the job to suit our needs. If you haven't added Jenkins' public key to your SCM's authorized_keys, now's a good time. After all that configuration, this is what becomes of it. Feel free to click on the links there. You will find all kinds of useful information about your codes and the unit test. Code coverage report is enabled by the Cobertura plugin. With this, you can get an overview of how well your unit testing codes are. 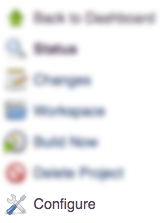 This bit decides what kind of weather icons assigned to your job after every build. For this blog post, this is as far as it goes. Next topic will be talking more about deployments.